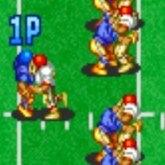 Description: Football Frenzy was a very under the radar American Football game created by NeoGeo. Originally released in the 90's to American arcades, this is easy and simple to play. Pick your plays, pass or hand off the ball and try to score touchdowns. Try to focus on improving while running with the ball, if you improve your running skills, this game will be easier played against the computer.